A general view of a black armband and match jersey, with the number 5 in honour of former Derry City captain Ryan McBride. DERRY CITY Football Club has agreed to meet members of the Ryan McBride Foundation next Monday to discuss proposals to rename the Brandywell Stadium after the club’s late, inspirational captain. The Foundation, a charity set up following McBride’s sudden death in March 2017, are hopeful the stadium will be re-branded ‘The Ryan McBride Stadium’, ‘The Ryan McBride Memorial Stadium’ or ‘The McBride 5 Stadium’, before the start of the 2018 Airtricity League season or, alternatively, before his first year anniversary on March 19th. And while there is, so far, no official position on the proposal by Derry City, chairman, Philip O’Doherty, yesterday confirmed his Board of Directors had agreed to meet members of the Foundation next Monday, January 22nd. Mr. O’Doherty said he had been contacted recently by Foundation representative Gareth McCay in relation to hosting a meeting and given the Board of Directors are meeting next Monday, it was agreed the Board would also host a meeting with the Foundation. “Obviously, we have developed very close links with the Ryan McBride Foundation and I would imagine that next Monday’s meeting would be informative with the Foundation letting us know how things are developing from their perspective,” commented Mr. O’Doherty. The Foundation made public its reasons behind the name change proposal on Sunday in advance of a public meeting tomorrow at the Gasyard Centre at 7.30 p.m.
Obviously, we have developed very close links with the Ryan McBride Foundation and I would imagine that next Monday’s meeting would be informative with the Foundation letting us know how things are developing from their perspective. The proposal must first get the green light from the stadium owners, Derry City & Strabane District Council which has appointed a five member working group which comprises of a councillor from each of the main parties and one independent, tasked with engaging with the public and working through the proposal. The Foundation’s proposal has been met largely with positive feedback online while they claim to have the support of the various ‘stadium users’ and ‘all but two’ of the Brandywell residents. “It is hoped this will be in place prior to the 2018 season or as part of events around Ryan’s anniversary on March 19th,” said a spokesperson. “Only the football stadium will be named with the Showgrounds pitch, greyhound track and park remaining as the Brandywell Complex. “Part of the Foundation’s remit from the outset was to create a legacy for Ryan, there is no more fitting a legacy than having the stadium named after him. 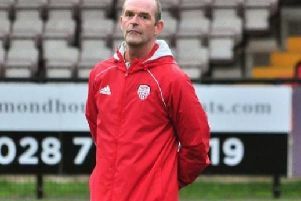 “We have received a lot of support from Derry City fans, however, we also understand the concerns of some Derry City fans and know that there will always be differing feelings on change. A spokesperson added that the proposed rebranding of the stadium would have ‘massive potential’ for the club and for the Council with regards to marketing opportunities.